A network of tiny pipes of water could be used to cool next-generation PC chips, researchers at IBM have said. Scientists at the firm have shown off a prototype device layered with thousands of "hair-width" cooling arteries. They believe it could be a solution to the increasing amount of heat pumped out by chips as they become smaller and more densely packed with components. The technology was demonstrated in IBM's 3D chips, where circuits are stacked one on top of the other. Laying chips vertically, instead of side by side, reduces the distance data has to travel , enhancing performance and saving critical space. "As we package chips on top of each other....we have found that conventional coolers attached to the back of a chip don't scale," explained Thomas Brunschwiler at IBM's Zurich Research Laboratory. "In order to exploit the potential of high-performance 3D chip stacking, we need interlayer cooling." Heat is seen as one of the major hurdles of producing ever smaller and quicker chips. It is the by-product of the movement of electrons through the tiny wires connecting the millions of components on a modern processor. As more and more components are packed on to chips - Intel recently launched a processor with two billion transistors, for example - the problems become worse. As a result, researchers around the world are engaged in a search for the most efficient way to take the heat off the chip industry. For example, in 2007, US researchers built tiny wind engines that created a "breeze" made up of charged particles, or ions, to cool computer chips. But the problems are exacerbated in the multi-storey chips which IBM, as well as others, believe offer "one of the most promising approaches" for building future processors. Each 4 sq cm sandwich is just 1mm thick but pumps out close to 1kilowatt - equivalent to that generated by a hotplate. Conventional cooling techniques such as fans and heat sinks do not work as well with the 3D technology, particularly as heat has to be drawn away from between the individual chips. To get around this, researchers piped water through sealed tubes just 50 microns (millionths of a metre) in diameter, between individual layers. Water is much more efficient than air at absorbing heat and so even with tiny amounts of liquid flowing through the system the researchers saw a significant effect. The idea of pumping liquids around computers is not entirely new. Early mainframe computers had water pumped around them. High end computers have been "modded" for a number of years with water coolers and various researchers and companies have put forward proposals for directly cooling chips with fluids. 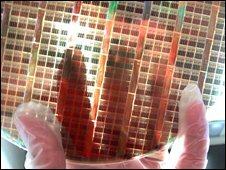 In 2003, Stanford University spin-out company Cooligy showed off its Active Micro-Channel Cooling (AMC) technology which allowed fluids to circulate through hundreds of tiny channels on the upper surface of a chip. The technology was used in some versions of Apple's Power Mac G5 desktop computer, released in 2004. IBM has said its water-cooling technology could be in products within five years.